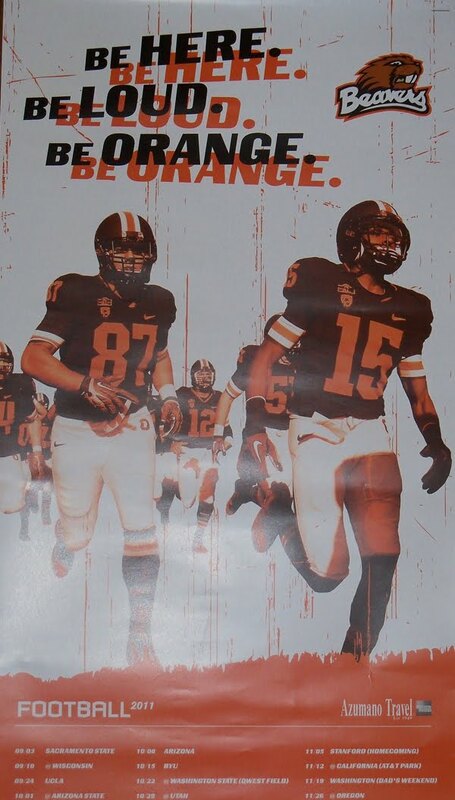 It's a fresh start for Oregon State, which produced this beautiful two-sided poster. Mike Riley, the dean of Pacific 12 coaches who spent 14 seasons in Corvallis, left in December for Nebraska. The Beavers replaced him with Gary Andersen, who resurrected the program at Utah State before a successful two-year run at Wisconsin. Andersen faces a rebuilding project on defense, which returns only two starters. The offense must find a replacement for productive quarterback Sean Mannion, now with the St. Louis Rams. Oregon State plays at Michigan on Sept. 12. Interim coach Ed Orgeron was riding high Friday night after guiding USC past Oregon State, 31-14, at Reser Stadium in Corvallis. The Trojans are 3-1 under Orgeron and have a unique opportunity to win five games in November. Image of Sport chronicled Friday night's game. There are more images after the jump and you can view the full catalog by clicking here. The 2010 season was a disappointment for Oregon State, which failed in its quest to be bowl-eligible for only the second time since Mike Riley returned as coach in 2003. Running back Jacquizz Rodgers left early for the NFL and his brother, James, is trying to return after two surgeries on his left knee. Oregon State plays at Wisconsin on Sept. 10 and plays host to Brigham Young on Oct. 15. Click the image to enlarge. Thanks to Hans. Police have arrested one man and are still seeking witnesses in relation to burn damage to the turf at Reser Stadium after Saturday's Civil War game between Oregon and Oregon State at Corvallis. Duck fans rushed the field and burned a "I Hate Your Ducks" T-shirt at midfield. Police identified the suspect through a photograph and this YouTube video. Cost of repairing the turf was estimated at $1,500. The Western Athletic Conference has suspended Boise State's Winston Venable because of this helmet-to-helmet hit on Oregon State's James Rodgers in Saturday night's game at Boise. Venable will sit out the first half of the Broncos' game at New Mexico State. He was originally suspended for a full game, but Boise appealed and got the penalty reduced. This is a tough one, but the Wiz decided to include this hit among the cheapies after the WAC took action. It certainly could be argued that Rodgers was blocked into Venable, who was trying to make a play on the ball. But the WAC deemed Venable's play was flagrant and assessed the suspension. Before the collision, Venable does put his head down and drives it into Rodgers' helmet. Thanks to Ryan and Geoff.